Steam to Victory is coming to the Age of Steam Roundhouse. 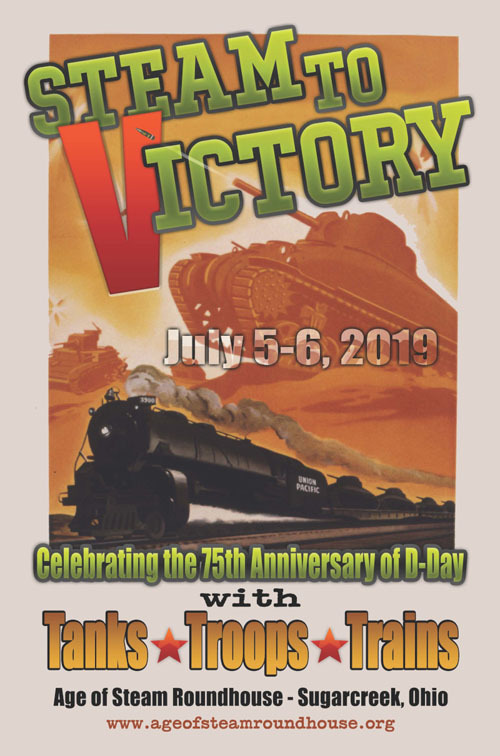 On July 5-6, 2019 (rain date July 12-13), the Roundhouse will host an event commemorating the 75th Anniversary of the D-Day Landings and the played by railroading in achieving ultimate victory in World War Two. Age of Steam is partnering with several reenacting and military vehicle preservationists for two days’ worth of living history, vehicle rides and exhibits, and special train displays. Groups taking part include historic military vehicles from two private collections, Crew 1944/5th Rangers, Co. B and Baker Co., 101st Airborne/502nd PIR, both of whom are Allied living history reenactors. Rounding out the attendees wil be the Marlboro Volunteers with their Military History Mobile Museum. More event details are coming soon. In preparation for Steam to Victory, some new projects have rolled into the Age of Steam Backshop. Ex-US Army locomotive #612 is undergoing an in-depth cosmetic restoration for use in military train displays. Along with new paint, a new smokestack and reinstallation of most parts, the engine has also been re-numbered back to #2630, which it carried when built by the Baldwin Locomotive Works in 1943. Age of Steam’s two former US Army flatcars are also receiving upgrades, including refreshed paint and new decking. The cars will be ready to “transport” historic military vehicles around the grounds during the event.